The T-5 Ford was Ford's answer to exporting Mustangs to Germany. Ford couldn't register the name "Mustang" in Germany because there were trucks with that same name. The horn button and gas caps merely said Ford. Special T-5 emblems replaced the Mustang emblems on the outside and dash of the car. The T-5 was available from 1964 to 1979. Twilight Turquoise 1965 T-5 hardtop owned by Julien S from France! This was our featured Attitude Of The Week for the week starting September 12, 2010. 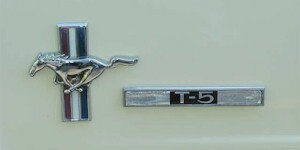 The T-5 was name for the Mustang as it was sold in Germany. This one has a 200ci 6-cylinder engine and a manual transmission.